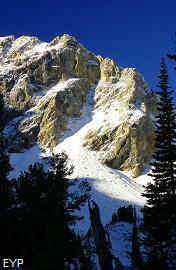 Paintbrush Divide, Paintbrush-Cascade Canyon Loop Trail, Grand Teton National Park. 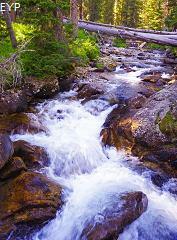 The Paintbrush Canyon - Cascade Canyon Loop Trail in Grand Teton National Park is a fantastic hike with amazing views! 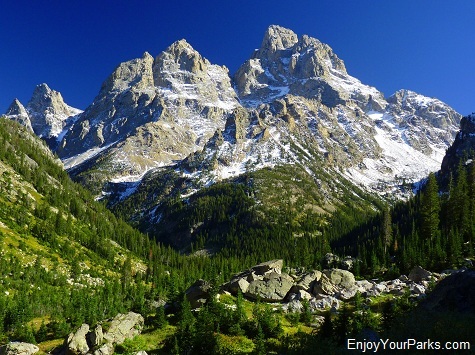 If you're up for it, the Paintbrush - Cascade Canyon Loop Trail in Grand Teton National Park takes you into the heart of the Teton Mountain Range. 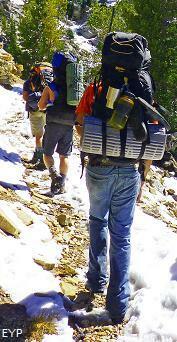 You'll hike up and over Paintbrush Divide, as well as hiking through two major canyons. You'll see many high mountain lakes, and actually hike right beside two of them, and the scenery the entire way is breathtaking. 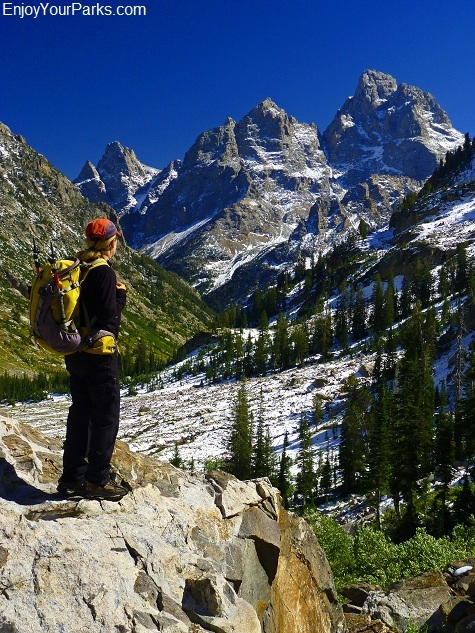 This 20 mile day hike is our favorite hike in Grand Teton National Park for many reasons, one of which is the fact that the views are constantly changing throughout this hike, and you actually get to see the backside of Grand Teton, Mount Owen and Teewinot Mountain. 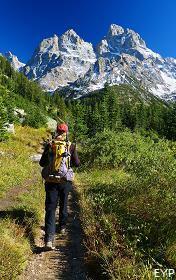 The Paintbrush - Cascade Canyon Loop is an outstanding hike for those interested in a longer hike in Grand Teton National Park. In addition to the scenery, there's a good chance you'll see a moose either heading up Paintbrush Canyon or heading down Cascade Canyon. 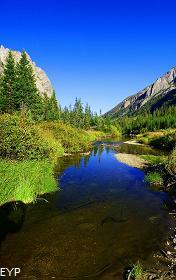 There is excellent moose habitat along the creeks that flow through these valleys. 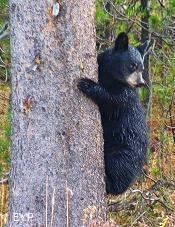 Keep an eye out for them especially in willowed areas along the trail and have your camera ready. 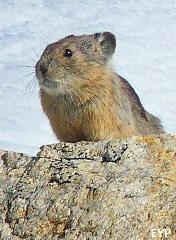 There are also plenty of pika, marmots and the occasional black bear. Cascade Canyon near Inspiration Point, or you can start at String Lake and take the Leigh Lake Trailhead and head up Paintbrush Canyon. We feel the absolute BEST direction to go is the latter. 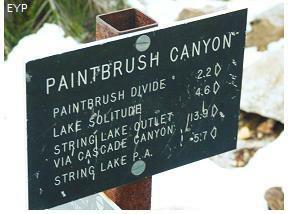 Starting at the head of Paintbrush Canyon at String Lake is by far the best way to go, mainly because of the views. When you you begin your hike early in the morning, Paintbrush Canyon glows in the morning sunlight. 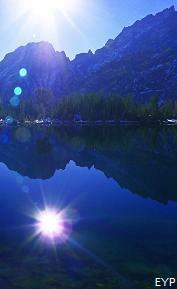 When you reach Holly Lake (5.6 miles), the sun is still in your favor and the lake is lit up by the morning sun. 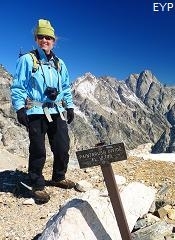 By the time you reach Paintbrush Divide (7.3 miles) the sun is still perfect for some great photos. 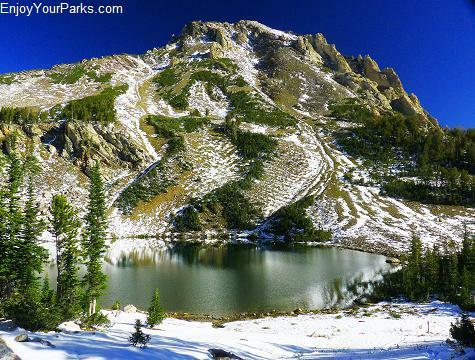 Then by the time you drop down into Lake Solitide (9.7 miles) and then work your way down the Lake Solitude Trail towards Cascade Canyon, the afternoon sun is bathing Grand Teton and Mount Owen in an absolutely extraordinary warm light. 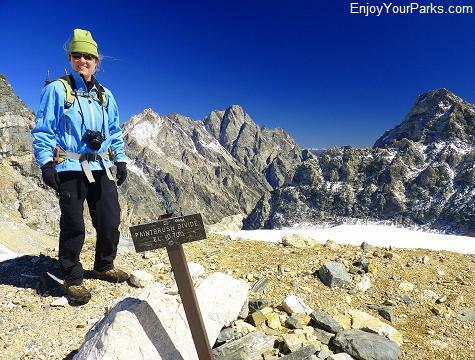 This stretch of the hike is our favorite because the views of these giant peaks are magnificent, and you are facing the view instead of the view behind you. And that's the problem with going up Cascade Canyon first- the views are behind you and the sun is wrong most of the way. 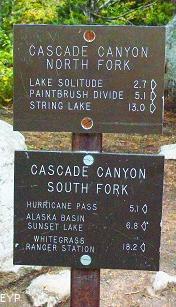 Therefore, we STRONGLY recommend that you hike up Paintbrush Canyon and hike down Cascade Canyon on the way back. Mount Woodring (11,590 feet) looms directly above Holly Lake, which makes for a perfect backdrop as you rest along its shore. 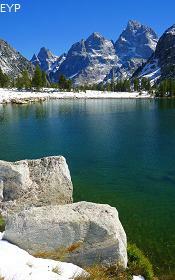 Holly Lake is a very enjoyable backcountry lake in Grand Teton National Park that you can rest at on your way up to Paintbrush Divide. 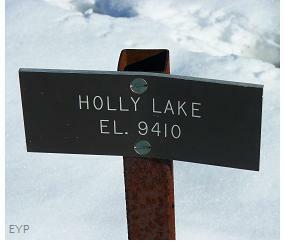 Holly Lake is 5.6 miles up Paintbrush Canyon from the Leigh Lake Trailhead, and it is 9,410 feet above sea level (Leigh Lake Trailhead is 6,877 feet). There is also overnight camping here if that is something that interests you. 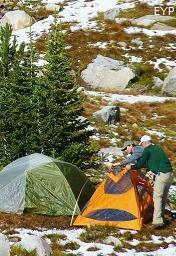 If it does, make sure to sign up for a campsite and get your backcountry permit well in advance. Trailhead: Leigh Lake Trailhead at String Lake Parking Area. 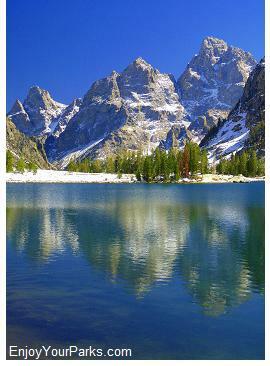 Holly Lake in Grand Teton National Park sits at the base of Mount Woodring (11,590), and the view is very nice. One of the advantages of going up Paintbrush Canyon instead of Cascade Canyon is that Holly Lake is lit up by the morning sun, whereas in the late afternoon the sun is blocked by Paintbrush Divide and the entire area is in shadows. 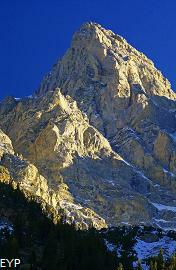 Mount Moran (center) is one of the many backdrops while on Paintbrush Divide in Grand Teton National Park. Paintbrush Divide (10,700 feet) is extremely picturesque, and you will probably burn through an entire memory card here. You can see forever to the west, and you get a great view all the way around. 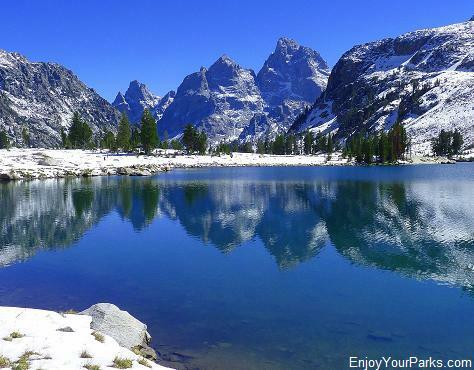 You are now in the heart of the Tetons, and you'll enjoy every moment you're up there! 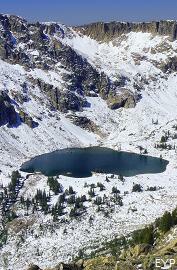 Paintbrush Divide is 1.7 miles west of Holly Lake, and 1,290 feet higher in elevation. 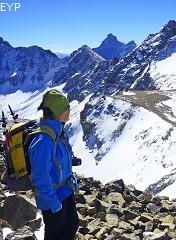 And there is one really great thing about getting to the top of the divide: The rest of your hike is all DOWN HILL! The wind is usually really howling on this divide, so make sure you bring a high quality wind-stopping jacket and pants and a hat or head band to cover your ears. You'll be really glad you did- trust us. 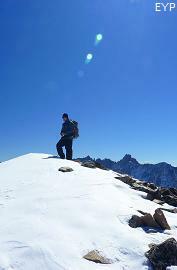 This is a high mountain pass, and there can be snow on it at any time of the year. 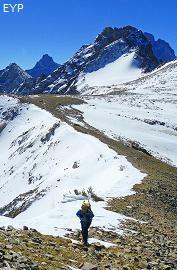 There is USUALLY snow on the pass even into mid-July. 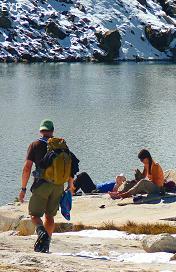 Ask a ranger at the Jenny Lake Ranger Station about conditions on Paintbrush Divide, and dress accordingly. 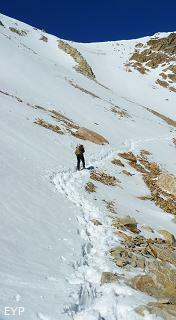 In early summer, mountain axes (ice axes) are very helpful. 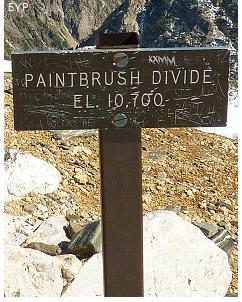 Most of the hike to Paintbrush Divide is above 7,000 feet. If you're not accustomed to this elevation, take your time- your body is not used to this elevation and it's not processing the oxygen as it should be. You may feel more tired than usual due to the decreased number of oxygen molecules in the air and in your blood stream. 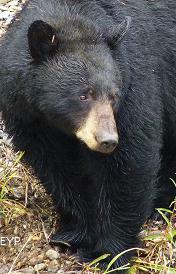 Informative E-Books and check out our "Ultimate Checklist". 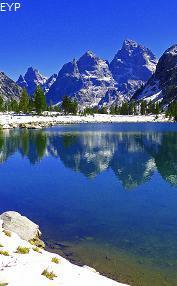 Grand Teton Peak, Mount Owen and Teewinot Mountain are reflected in the famous Lake Solitude. 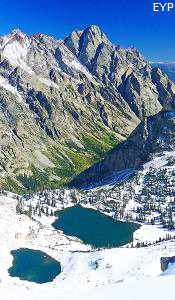 Lake Solitude (9,035 feet) in Grand Teton National Park is 1,665 feet below Paintbrush Divide to the west (2.4 miles from the divide). 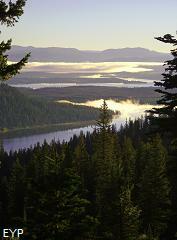 It's a very famous backcountry lake, and the view of the Tetons from here is fantastic. This is the farthest point of your journey (9.7 miles), and is where you begin working your way down to Cascade Canyon and back home again. This is a great place to have lunch and rest because it is essentially the halfway point on your Paintbrush-Cascade Canyon Loop hike. 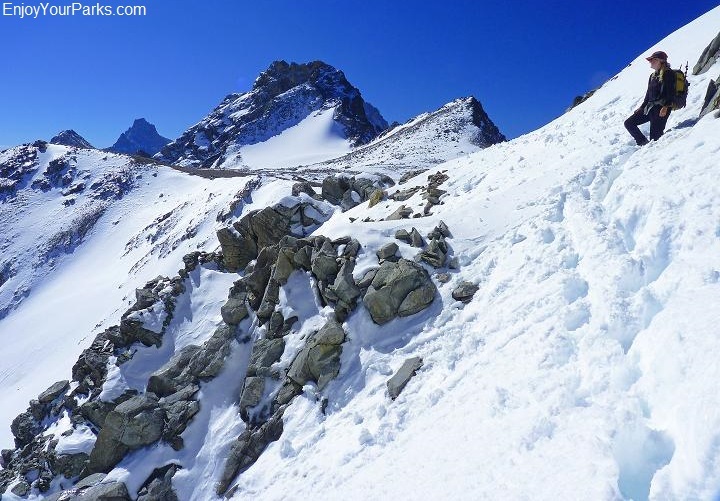 There are backcountry campsites just about a half mile south of the lake, so if this interests you, make sure you sign-up for a spot far in advance. 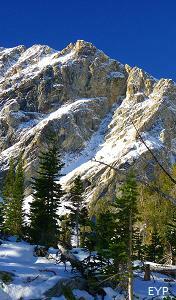 This is an iconic view of Grand Teton and Mount Owen from the Lake Solitude Trail in Grand Teton National Park. 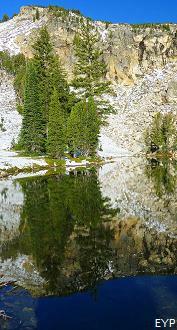 Lake Solitude Trail and Cascade Canyon Trail. 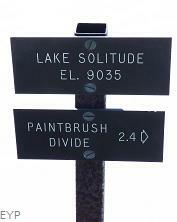 You will eventually reach Inspiration Point and the junction to String Lake which is where your vehicle is parked. 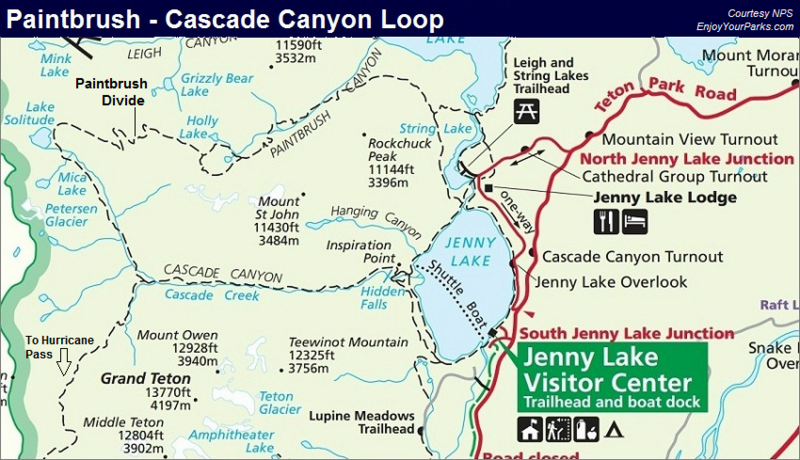 If you want to take a short-cut, just before you reach Inspiration Point there is a trail to your left that is well marked that takes you directly to the trail the skirts along Jenny Lake and eventually back to String Lake parking area. before you get back to your vehicle. 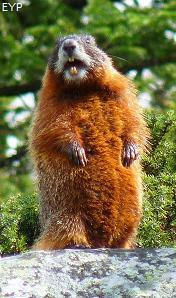 3) Be prepared for all types of weather. 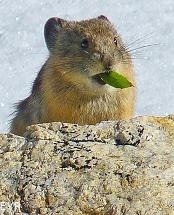 4) Bring plenty of food. 5) Bring a water filter. 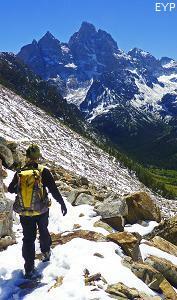 For details on what to bring and what to wear on your hike around the Paintbrush - Cascade Canyon Loop, visit our Informative E-Books. 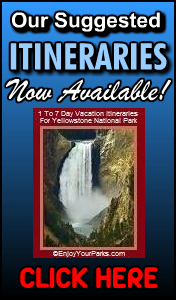 We also have a helpful E-Book devoted to our Suggested Itineraries for Grand Teton National Park. To see all of our helpful E-Books, click here.